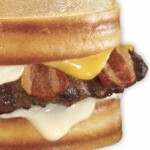 Hardee’s is offering a FREE Amazing Grilled Cheese Bacon Burger on July 4th. No purchase necessary. One per customer while supplies last. Limited to 50 per restaurant. Dine-in customers only. Guest must be present and dressed in a Spider-Man costume. No masks allowed Offer good only on July 4th, 2012 starting at 11am. At participating restaurants.